The Youth Affairs Network of Queensland Inc (YANQ) is the peak community youth affairs body in Queensland, representing individuals and organisations from Queensland's youth sector. YANQ believes that everybody, young people included, should be free to exercise their human rights. Due to funding cuts YANQ currently is operating with minimal staff. The Network is managed by a committee made up of elected members. All network members are eligible to be elected to the Management Committee. We advocate on behalf of young people in Queensland, especially disadvantaged young people, to government and the community. We promote and support cultural diversity and encourage the development of policies and programs that respond to the rights and needs of young people. The chart bellow indicates the structure of YANQ prior to loosing all state government funding over three years ago. As a result of the cuts we are currently operating with minimal staff and mainly with the energy and support of our members and volunteers. We hope the Queensland labor government reinstates YANQ's funding which was cut by the LNP over three years ago. YANQ is the only voice for youth issues and the youth sector in Queensland. Our young people deserve more from the state government. 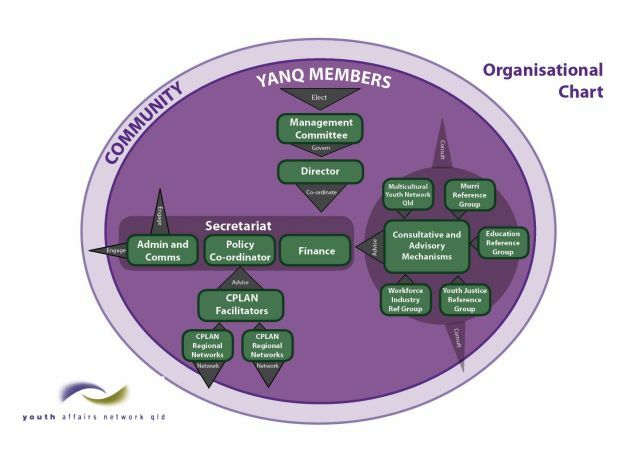 YANQ annual reports document the yearly work of the network, including reports from the Treasurer, President and Director.